When I close my eyes and imagine the first Christmas, the one with Mary and Joseph, certain images come to my mind. I see the couple huddled in a stable. I see the baby in a manger surrounded by animals. I see wise men, shepherds, and a star. Since there is a star it is always dark, the middle of the night. Where did these images, especially the night, come from? They come from Christian art and hymnody. During Christmas we sing some of the most famous Christian hymns, we know them by heart. The world in solemn stillness lay To hear the angels sing. The classic hymn “Lo, How a Rose E’er Blooming,” that I learned through Manheim Steamroller years ago, tell us it was midnight. As men of old have sung. This Rose that I have in mind. The Virgin Mother so sweet and so kind. These hymns, and classical Christian art, bear witness to the Christian tradition that Jesus was born at midnight. For many modern Protestants, especially Evangelicals, this is a complete mystery. The Gospels are silent on the timing of Jesus’s birth. 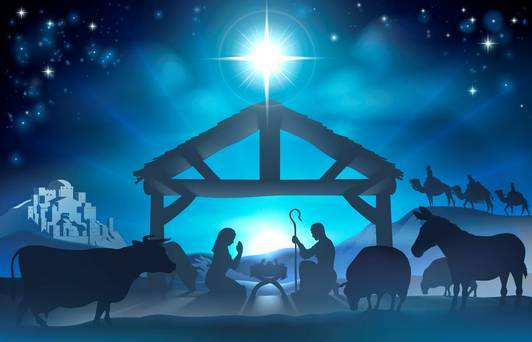 Luke tells us that the angels appeared to the shepherds in the night and that Jesus was born “this day” but does not suggest the time of either the birth or when the shepherds found the Holy Family. So where does the deeply rooted worship and artistic tradition arise that Jesus was born not only at night but midnight? It comes from a book that many Evangelical Christians do not have in their New International Version of the Holy Bible. This passage in its literary context refers to the Exodus from Egypt. But the Church Fathers read Wisdom the same way the Gospel of Matthew did Hosea 11.1 (which also applies an Exodus text to Jesus), that is as a typological prophecy of the Incarnation. It does after all speak of the “logos.” The eighth century biblical scholar Rabanus Maurus is representative in how Wisdom was understood by Christians for centuries (Rabanus simply assumes Wisdom is Scripture). The traditions passed on by artists and hymn writers were the ones they had learned themselves in what they believed was Scripture. The sources of those traditions are lost to modern Evangelicals and Restorationists today but the traditions remain but are a mystery. So though many have probably never heard of it, the Wisdom of Solomon influences us to this day. It shows up each Christmas.